Children attend classes at a school in Gao, Mali. There is an urgent need for greater headway in education without which, on current trends, the world will be half a century late for achieving the education-related goals contained in the 2030 Agenda for Sustainable Development, according to a new United Nations-backed independent report. 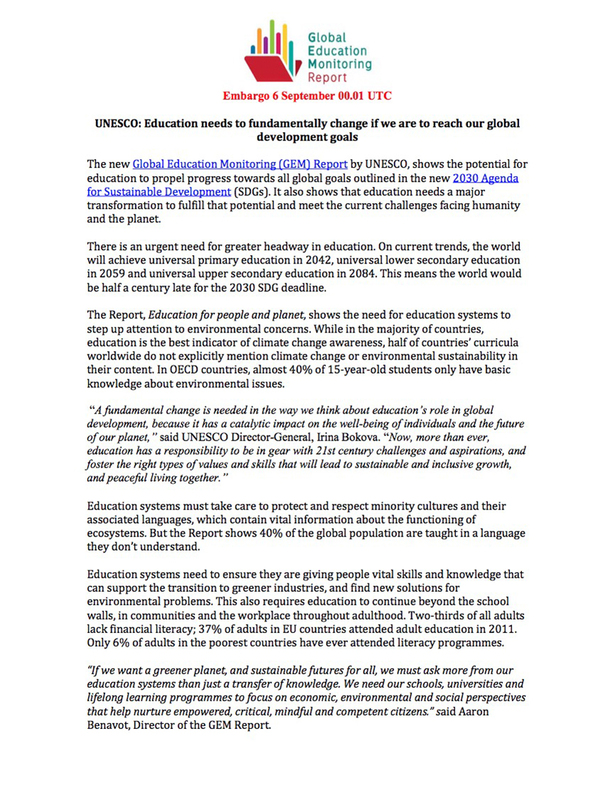 “A fundamental change is needed in the way we think about education’s role in global development,” the Director-General of the UN Educational, Scientific and Cultural Organization (UNESCO), Irina Bokova, said in a news release on the launch and findings of the Global Education Monitoring (GEM) Report, entitled ‘Education for People and Planet,’ which UNESCO commissioned. “Now, more than ever, education has a responsibility to be in gear with 21st century challenges and aspirations, and foster the right types of values and skills that will lead to sustainable and inclusive growth, and peaceful living together,” Ms. Bokova added. On 1 January 2016, the 17 Sustainable Development Goals (SDGs) of the 2030 Agenda for Sustainable Development — adopted by world leaders in September last year – officially came into force. 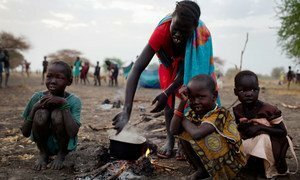 Over the next fifteen years, with the aim of achieving the SDGs, countries will mobilize efforts to end all forms of poverty, fight inequalities and tackle climate change, while ensuring that no one is left behind. In particular, Goal 4 of the SDGs is centred on ensuring inclusive and equitable quality education and promoting lifelong learning opportunities for all. According to the GEM Report, which tracks worldwide progress towards UN global education targets, currently, the world will not achieve universal primary education before 2042, universal lower secondary education before 2059 and universal upper secondary education before 2084. In relation to the environment, the GEM Report finds that education systems need to step up in this area. While in the majority of countries, education is the best indicator of climate change awareness, half of countries’ curricula worldwide do not explicitly mention climate change nor environmental sustainability in their content. Children conduct a science experiment in a classroom in Harar, Ethiopia. UN Photo/ Eskinder Debebe. For example, the report notes, in countries belonging to the Organisation for Economic Co-operation and Development, almost 40 per cent of 15-year-old students only have basic knowledge about environmental issues, according to the report. Also, despite being one of the regions most affected by the effects of environmental change, sub-Saharan Africa has far fewer mentions of sustainable development in its curricula in comparison with Latin America, Europe and North America. As millions of children around the world prepare to return to school this month, the United Nations Children’s Fund (UNICEF) today highlighted that in the top ten countries with the highest rates of children missing out on primary education, nearly two in every five children – 18 million – are out of school.